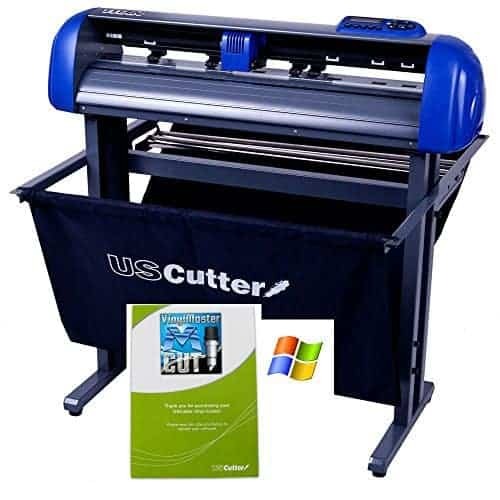 The USCutter Titan 3 Vinyl Cutter is a top choice as a commercial machine in small businesses. The Titan 3 cutter is brilliant for businesses that wish to work with applications such as signage, decals, lettering, and pinstriping. This machine can whip up logos, modify signs, make custom text, create and draw shapes and edit images. It is a great buy for your starting machine in a commercial space. Wondering whether the USCutter Titan3 Cutter is for you? Hopefully, our USCutter Titan 3 Vinyl Cutter Review will help answer that question for you. Find below our review rating of this great electronic commercial-grade cutting machine. 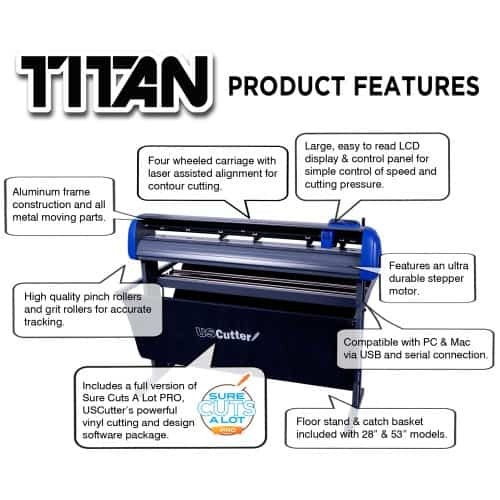 The USCutter Titan 3 is a commercial machine that is perfect for small business use. The plotter can withstand rigorous daily use. Standout features include the optical eye for accurate and precise contour cutting, and its ability to handle intricate designs. At an affordable price-tag, this truly is a handy machine to have in your office or store! Vacuum hold down for extra grip. Accurate automatic contour cutting. LCD Screen that is easy to use and read. The digital readout makes for accurate and precise settings. 3 TITAN blades included. FREE Lifetime Phone Support. No manual is included. Doesn’t work well outside of the US. The USCutter vinyl plotters are fabulous machines for those who are chasing a starter commercial machine for their small business. We do prefer the Graphtec over the USCutters, but if you can’t reach the higher price tag of the Graphtec cutters, then the USCutters are a great place to start. If you do want to compare this machine against other machines, you might like to visit our detailed vinyl machine buyers guide. The Titan Vinyl Plotter uses ARMS (automatic registration mark sensor) for fast and accurate contour cutting. Uses an ultra-durable low-noise servo motor. We love that you have total control over the speed and cutting force. This means that you can cut all sorts of material from adhesive vinyl, window film, hard paperboard, sandblast stencil, mask material and much more. The cutter has a very easy-to-use LCD interface. The machine is perfect for daily rigorous use. It has an aluminum frame and uses metal parts. I can apply a maximum pressure of 750 g.
It has 3 pinch rollers. The machine includes Sure Cuts a Lot PRO (Mac) or VinylMaster Cut for PC users. It comes in three brilliant sizes! 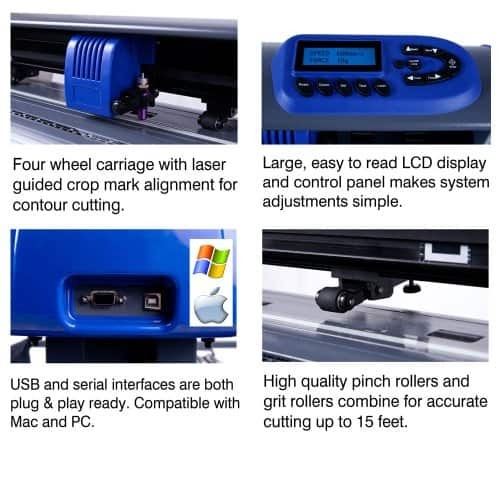 The 15″ Titan 3 Desktop Cutter, the 28″ Titan Vinyl Cutter and the 68″ Vinyl Cutter for those who wish to work on a large scale basis. This specific model is the 28″ model, which means that the cutter can cut up to 24″ in width and up to 300″ in length. It has a feed width of up to 28″. The Titan 3 is a professional commercial machine that has been created to withstand rigorous daily use. We love some of the advanced features, such as the optical eye for accurate and precise contour cutting. The cutter can handle intricate designs, this truly is a handy machine to have in your office or store!